On Wednesday morning, October 19, southwest Idaho activists and Wild Idaho Rising Tide (WIRT) are holding the third protest of a state oil and gas lease auction. 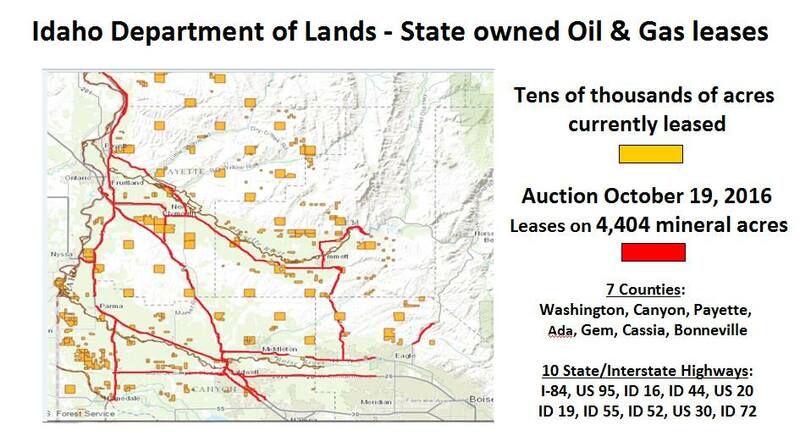 The Idaho State Board of Land Commissioners is selling 225 oil and gas leases of state lands and minerals at another public auction in Suite 103 Syringa North and South Conference Rooms at the Idaho Department of Lands (IDL) offices, 300 North Sixth Street in Boise, Idaho . Before bidder arrival for registration begins at 8:30 am MDT for the 9 am auction, gather with us at 8 am at the east side of Capitol Park, across the street from IDL, and then on the public sidewalk in front of the main IDL west entrance. Please bring your posters, signs, chants, and songs objecting to further liquidation of state resources for private industry profit, despite state-perceived benefits for public agencies, institutions, and programs. See descriptions of the last two state oil and gas lease auction protests for ideas about messages and tactics to challenge this first such state auction in over two years [2-5]. The state of Idaho has already, currently leased tens of thousands of surface and subsurface acres to only a few companies, for looming oil and gas drilling and potential hydraulic fracturing, acidizing, and other risky well stimulation treatments. Since 2009, Bridge Resources and its more aggressive successor, Alta Mesa of Houston, Texas, have drilled or received state permits for dozens of wells, planning more dirty energy development for the Treasure Valley and elsewhere in Idaho than the company ever reveals. Apparent from the strange placement of bargain priced lease parcels, shown in the maps of this October 19 round of IDL auctions, the latest scheme of Alta Mesa and bidder accomplices may involve visions of corridors for access, transportation, pipelines, or other infrastructure. The state is almost giving away 4,404 acres in seven counties as 82 oil and gas leases in Canyon County, 73 in Payette County, 31 in Gem County, 23 in Ada County, 13 in Washington County, two in Bonneville County, and one oil and gas lease in Cassia County. Remarkably, most of these leases lie along and adjacent to ten state and federal highways in the Treasure Valley – Idaho Highways 16, 19, 44, 52, 55, and 72, U.S. 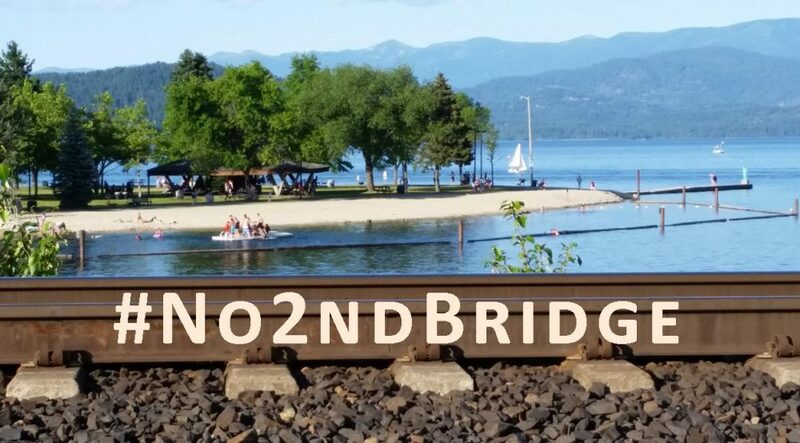 Highways 20, 30, and 95, and Interstate 84 – all threatening blocked public access to private lands [6, enclosed photo]. Regional residents increasingly fear inevitable contamination of our groundwater, wells, and lands, the jeopardy of our property rights, values, mortgages, and insurance, and the ultimate destruction of our health, safety, and quality of life. Meanwhile, the oil and gas industry quietly sneaks among communities, leasing more private, state, and federal lands as entry points and dangerously disposing thousands of gallons of hazardous wastewater in storage ponds at a county landfill and undisclosed locations as end results . Nonetheless, the state plans further oil and gas lease auctions in May and October 2017. Investigate the IDL website for more information about this auction, including public notices, lists and maps of lease tracts, lease stipulations and forms, and a “guide to split estates in oil and gas development” (wherein state underground mineral lease interests trump surface landowner protections and property uses) . Talk with your family, neighbors, co-workers, and friends about the threats imposed on Idahoans’ air, water, economy, and lifestyles by fossil fuel extraction in their vicinity. Come to this Third Idaho Oil and Gas Lease Auction Protest to connect with similarly concerned citizens and organizers and to coordinate expanding, exciting, and effective resistance that confronts the root causes of climate change, global pollution, and imperiled freedoms. Please continue to share notice of this spontaneous, grassroots demonstration, and ask and encourage everyone to attend. Thanks!